Wait wait wait. Okay there were a couple of summers where I DID get sick of pizza, but please don't tell pizza that. We have a good relationship going right now. We see each other on a weekly basis. My point is, I made pizza for dinner last night (legitimate homemade pizza) and then Mike and I left to go see an 80's cover band with my co-workers and guess who left the really good pizza sitting out on the counter and didn't put it in the fridge and now it's ruined and there won't be any leftovers for anyone? We'll just blame it on Pete shall we? Two things can ruin pizza night: (can you put two colons in a sentence of sorts without any other punctuation between them...?) 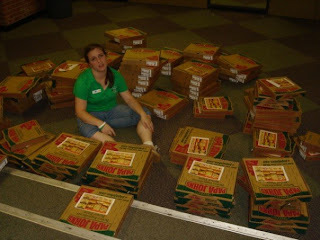 Organizing pizza for 300+ people and also leaving good pizza out on the counter.